Berger J, DeGolier T, (2008). Pharmacological effects of the aqueous extract of Caulophyllum thalictroides (blue cohosh) on isolated Mus musculus uteri. Bios;79(3):103-14. Datta, S., et al. (2014). “Toxins in botanical dietary supplements: blue cohosh components disrupt cellular respiration and mitochondrial membrane potential.” J Nat Prod 77(1): 111-117. Finkel, R. S. and K. M. Zarlengo (2004). “Blue cohosh and perinatal stroke.” N Engl J Med 351(3): 302-303. Gunn, T. R. and I. M. Wright (1996). “The use of black and blue cohosh in labour.” N Z Med J 109(1032): 410-411. Click here. Jones, T. K. and B. M. Lawson (1998). “Profound neonatal congestive heart failure caused by maternal consumption of blue cohosh herbal medication.” J Pediatr 132(3 Pt 1): 550-552. Kennelly, E. J., et al. (1999). “Detecting potential teratogenic alkaloids from blue cohosh rhizomes using an in vitro rat embryo culture.” J Nat Prod 62(10): 1385-1389. Romm, Aviva Jill (2009). “Blue Cohosh: History, Science, Safety, and Midwife Prescribing of a Potentially Fetotoxic Herb.” Yale Medicine Thesis Digital Library. Paper 88. Wu, M., et al. (2010). “Teratogenic effects of blue cohosh (Caulophyllum thalictroides) in Japanese medaka (Oryzias latipes) are probably mediated through GATA2/EDN1 signaling pathway.” Chem Res Toxicol 23(8): 1405-1416. Hi, my name’s Rebecca Dekker, and I’m a nurse with my PhD and the founder of Evidence Based Birth®. In today’s video we’re going to talk about the evidence on using black or blue cohosh to induce labor. 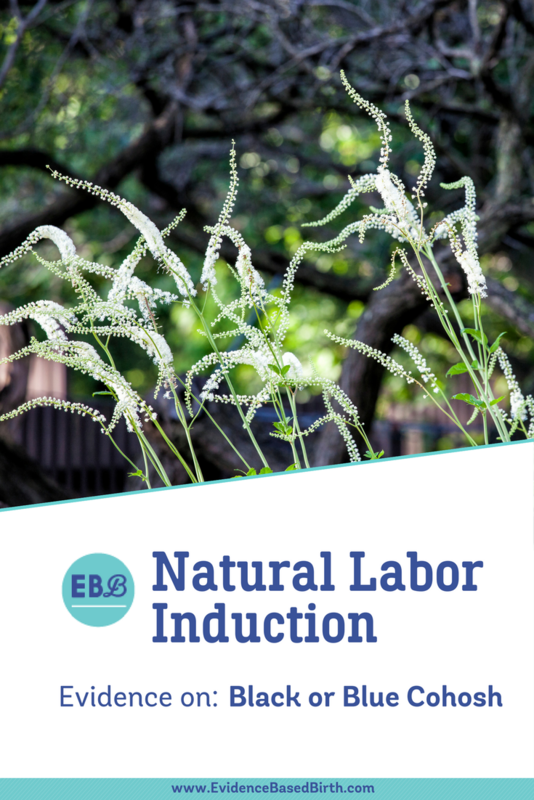 In today’s Q&A we’re going to talk about using black or blue cohosh to start labor. To give you a sneak peek of what we’re going to talk about, basically there has not been a ton of research on black and blue cohosh, but the research that we have suggests that there are major safety concerns with both of these herbs. More has been written about blue cohosh than black cohosh. In 2009, Dr. Aviva Romm conducted a systematic review of the literature on blue cohosh for her thesis requirement for her MD from Yale University. You can read this article for free online. I’ll link to it in the blog article for this video. Blue cohosh comes from a plant, and it was used traditionally by Native Americans to treat gynecology problems, to induce labor and augment labor, to reduce the pain of childbirth, and to induce abortion. 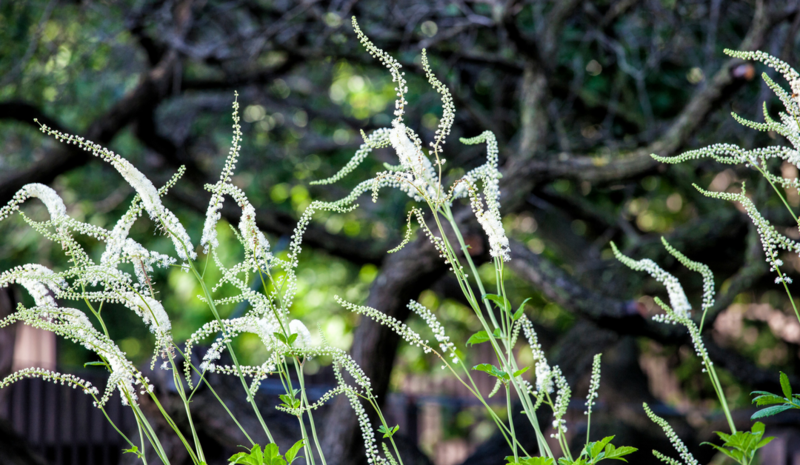 Black cohosh is not from the same class of plants, but it is often used in combination with blue cohosh, and it’s also commonly used to treat gynecology problems. Native American women reportedly took blue cohosh as a strong tea, but the herb is extremely bitter, so most women today take it as a root powder in capsules or tablets, or as a tincture. Dr. Romm’s paper gives detailed reports of both traditional and modern dosages. We do not have any randomized trials or observational trials on black or blue cohosh, which is concerning given that there have been four serious case reports that have been published in the literature about serious adverse effects from using black and blue cohosh. The first case report was published about a 39 year old first-time mother who consumed several doses of black cohosh with the intent to induce and augment labor. She subsequently experienced something called severe hyponatremia, or severe low levels of sodium or salt in the blood. When she arrived at the hospital, her serum sodium levels were only 114; normal is 132 to 145. Severe acute hyponatremia is a medical emergency that can lead to brain damage or death. This mother was treated for the hyponatremia and gave birth without any further complications after the treatment was successful. The second case report is of a 24 year old first-time mother who drank a tea made from blue cohosh that she was using to induce labor. She gave birth by caesarian to a newborn who experienced a stroke. The dosage and preparation of her blue cohosh are unknown. When they tried to figure out the cause of the stoke, they found that both the baby’s urine and meconium were positive for a cocaine metabolite, so they tested the contents of the mother’s bottle of blue cohosh and the contents of a sealed bottle of a different preparation of the herb, and the tests found the same results. In correspondence in this journal, the authors clarified that blue cohosh is not known to contain this metabolite of cocaine, and they think that the most likely explanation is maybe that there was some cross-reaction that confused the test results, or that the test data were interpreted incorrectly. The third case report is of a 36 year old mother who was giving birth for another time. She had given birth before. She took blue cohosh to induce labor and gave birth to a newborn who experienced a heart attack. The baby actually had a heart attack and experienced profound heart failure and shock. The mother had a precipitous one-hour labor, and she gave birth vaginally at 41 weeks. She reported taking three times the dose that was recommended by her midwife. She took three tablets a day for three weeks. The quantity of blue cohosh in the tablets that she took is unknown. The baby was critically ill for several weeks before recovering enough to go home. The child was still receiving therapy for heart failure at two years of age. The authors claimed that they ruled out any other possible causes of the heart attack, so they do believe that the heart attack was due to the herb. The fourth case report is of a woman who took blue cohosh in combination with black cohosh to induce labor at 41 weeks and six days. The dosage and preparation that she took is unknown. After a planned home birth, the baby had very low Apgar scores, and the two midwives attempted resuscitation when the baby did not breath after birth. They transferred the baby to the hospital. This baby experienced severe multiorgan injury due to low oxygen levels and permanent brain damage. The authors cite the cohosh as a possible contributor to the injury, but it’s possible that that might not be the cause as well — we don’t know. We also have four animal studies on blue cohosh. One animal study looked at the possibility of blue cohosh to cause birth defects, miscarriage, or stillbirth. They found that blue cohosh disrupted the heart development and skull and face development in fish embryos. They believe that blue cohosh is a possible contributor to birth defects. Another study looked at the effects of blue cohosh on isolated uterine tissue from mice. They exposed the tissue of the uterus to an extract of blue cohosh and they found that all tissues did increase contractions, the frequency of contractions, the force of contractions, and muscle tone. The higher the dose, the stronger the contraction forces. Another study took isolated rat embryos and exposed them to blue cohosh, and found that both high and low doses were lethal to the embryos. The embryos were killed by the blue cohosh. Then a fourth animal study looked at the effects of a component of the blue cohosh on animal uterine and cardiac tissue. They included rats, rabbits, guinea pigs, turtles, and frogs in their animal tests. They did find that uterine tone did increase and that the uterus contracted more. They also found a decrease in blood flow to the heart and a decrease in the heart’s ability to contract when it was exposed to blue cohosh. The higher the doses, the worse the effects. There’s one cell-based study on blue cohosh. Scientists looked at blue cohosh and its effects on cells of 352 different species of plants and other organisms. They found that blue cohosh disrupts the mitochondria of cells. They think that that is the link that’s what causes the cardiotoxic effects and the other effects, such as the birth defects. In summary, there are no clinical trials or observational studies involving blue or black cohosh in pregnancy. The available evidence focuses mainly on blue cohosh, and there are four case reports, four animal studies, and one cell-based study. The limited evidence that we have suggests that while blue cohosh does appear to induce contractions, it can also cause birth defects, it can be toxic to the fetus and toxic to the heart. The researchers say that the most prudent approach at this time would be to avoid blue and black cohosh. Especially avoid blue cosh during pregnancy. If someone does decide, together what their provider, to induce labor with these herbs, there is information in Dr. Romm’s paper about how it’s important to use the tiniest dose possible for a very, very short-term period no longer than one day, and that there should be careful maternal and fetal monitoring. Basically, the safety concerns of these drugs are immense, and we need more research on this because, if it’s going to be used as an induction method, we need to know if it’s safe. So far, the case reports and animal studies that we have suggest that it’s not safe. That’s it for today’s Q&A video. Bye.